A schoolboy has impressed experts at US space agency Nasa after capturing a rare picture of a meteor burning out above his home town in south Wales. Jonathan Burnett, 15, was taking snaps of his friends performing skateboarding stunts near his home in Pencoed near Bridgend when a bright light in the sky caught his attention. 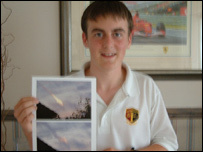 He took two photographs of the fiery ball before it burned out and rushed home to show his parents. Later, he e-mailed the picture to Nasa asking for an explanation and was amazed to discover that the space experts were so impressed with his snap they had published it on their website. His father Paul explained: "He has a digital camera and was out taking some pictures of his friends on the street. "A little boy ran over and shouted 'look the sun has exploded' and Jonathan turned around and managed to take two pictures of it. "None of us knew what it was and we thought that maybe it was a plane that had exploded. "We were really keen to find out what it was, and so without us realising it, Jonathan had emailed the picture to experts at Nasa to ask for an explanation. "The next thing we knew that they had used the picture on their website," he said. Jonathan, who attends Pencoed Comprehensive School, said: "It was such a coincidence that we happened to be in the street at the time. "I was trying out my new camera to take pictures of my friend who was doing a skateboarding trick. "I took the first picture and then about two minutes later I took the second one before it burned out. "One of our first thoughts was that it was the sun reflecting off the clouds. "Everyone in school is amazed - most of my friends believe me but there are some who said they don't believe me. "I am really interested in photography - but I don't think I will ever manage to take another picture like that," he added. On its website Nasa described the teenager's picture as a "sofa-sized rock came hurtling into the nearby atmosphere of planet Earth and disintegrated". "By diverting his camera, he was able to document this rare sky event and capture one of the more spectacular meteor images yet recorded. Roughly one minute later, he took another picture of the dispersing meteor trial. "Bright fireballs occur over some place on Earth nearly every day. "A separate bolide, likely even more dramatic, struck India only a few days ago." What could it be? Tell us what you think the fireball is? Send in your suggestions using the form below. It's a thing of beauty and mystery, two things there are not enough of in the world today. How come the fire ball is still there 1 or 2 minutes after the first picture. I always thought these events were over in seconds? I agree with Chris Roussel: I've seen an F1-11 do this when dumping fuel over Norfolk some years ago. Although the USAF denied it! It could well be a meteor, then again it may not be. The fact is, that the young man has captured an image that has impressed NASA. As a photographer, I know the importance in getting the image, and has done a good job. Up until last year I lived in Cardiff, just up the road from Pencoed. I have seen this before on several occasions when Concorde has flown over. It's obviously a meteorite. If NASA is claiming otherwise, it sounds they're trying to cover it up! I can't see why, unless they're worried because it's a meteorite they didn't detect. Or it's a satellite they've crashed deliberately, but didn't tell anyone. It can't have been a meteor if he took those pictures two minutes apart as the article says. When I was about 9 at home, my friends and I were outside one evening and saw something in the sky, it was smaller but brighter as it was night, I always wondered what it could have been, but thought it too big to be a meteor, now I've read this, I think it probably was. If it was a meteor breaking up, would the orange glow last so long, once it had burnt up wouldn't the glow stop as the smoke trail did? No combustion, no light? It looks very different to the meteor that I saw last December hurtling across the M27 towards Southampton. It had a very bright concentrate sphere of light with a long tail of (less bright) light that changed from yellow through orange to red. It did not look on fire as this picture shows. The NASA website today says that a "better hypothesis is an unusual airplane contrail reflecting the setting sun." They've thought better of their initial meteor hypothesis. I saw something similar when I was up on Dartmoor at dusk in April about 4 or 5 years ago. It started as a very bright light hurtling across the sky, then it broke into 3 parts and burned out. About a 30 seconds later there was a loud bang followed by 2 sonic booms. It left a small circular cloud in the sky were it entered. 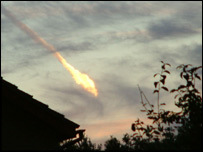 Many people in the south west UK saw it and it was reported as a meteor. At the time I thought it might be the second stage of a rocket re-entering with the remaining fuel exploding. I sent the details to Dr Geoff Perry of the Kettering Group, but he said that no space debris re-entered at the time. Just a theory, but it does look very similar to what happens when an F1-11 vents fuel which is then ignited by it's afterburner. If only he'd aimed more to the left he'd have gotten a unique picture of the dragon itself! I think it's a terrible photo - if only he'd aimed more to the left he'd have gotten a unique picture of the dragon itself! I believe this to have really been a sofa sized sofa from a large furniture store, you know the prices these days are out of this world! Meteor, rubbish; it's a large orange balloon that is deflating. The fireball is Tony Blair's ego after it came hurtling back down to Earth after his massive disaster that was the foundation hospitals vote. In years gone by, fireballs in the sky were thought to herald forthcoming disaster - indeed, the very word 'disaster' means 'bad star'. One look at the news would seem to confirm this possibility! The contrail is darker on one side (away from the sun) which is against it being a meteor. I see many contrails that begin and end abruptly. They are often in a variety of shapes. Almost certainly a meteor fragmenting in the upper atmosphere. If it was sunlight off a contrail why does it end so abruptly? I work in Heathrow and see thousands of contrails a day, and never seen one like this before. Its Geoff Hoon's reputation going down in flames! As a Frenchman, I would say it's an Alien space ship who could not understand the orders - given in Welsh - to slow down as they were approaching Earth! "Personally I think it's a meteor that's exploded"